"Come to the neighborhood, if you want to see her… There's something quite special about her…" Screen Media has debuted the official trailer for a light-hearted drama titled Change in the Air, the directorial debut of a filmmaker named Dianne Dreyer, who has worked for nearly 30 years as a script supervisor. When a beguiling woman moves in next door, a quiet neighborhood is awakened, bringing people face to face with their secrets and, ultimately, themselves. There's a peculiar mystical side to this that is uplifting and mysterious. Is she supposed to be God? Rachel Brosnahan (from "The Marvelous Mrs. Maisel") stars, with Mary Beth Hurt, Peter Gerety, Aidan Quinn, Olympia Dukakis, Macy Gray, Satya Bhabha, M. Emmett Walsh, Seth Gilliam, and Michael Potts. This looks charming and whimsical, worth a look. A charming, mysterious woman named Wren Miller (Rachel Brosnahan) moves into a quiet, small-town neighborhood, but brings about deep secrets in her new neighbors. Along the way, their story embraces the imperfections that make humans while offering a way to set them free. 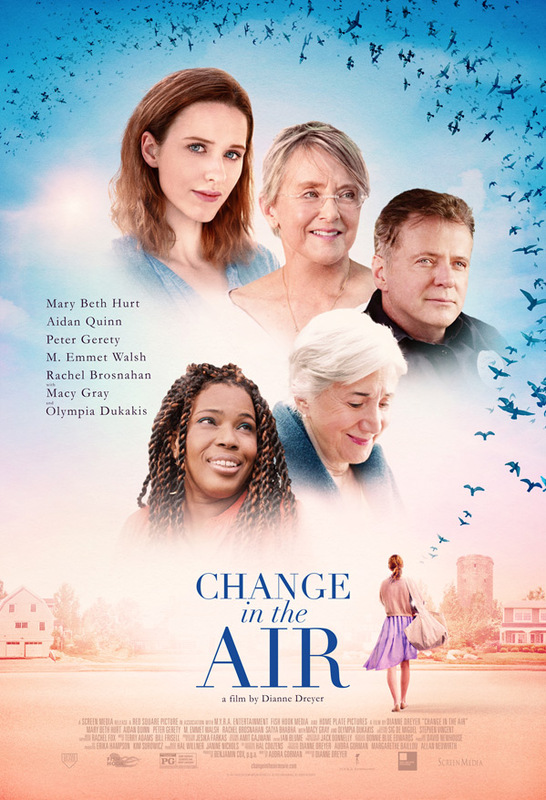 Change in the Air is directed by American filmmaker Dianne Dreyer, making her feature directorial debut after nearly three decades of work as a script supervisor previously. The screenplay is written by Audra Gorman. This hasn't premiered at any film festivals or otherwise before, as far as we know. Screen Media Films will release Dreyer's Change in the Air in select theaters + on VOD starting October 19th this fall. Anyone interested in catching this film?